I'm finding more Nuclear EK, now that it's been updated and the traffic patterns have changed. See my 2014-12-10 blog entry for details on Nuclear EK's new traffic patterns (payload being XOR-ed, etc). Unlike the 2014-12-10 blog entry on Nuclear EK, this one was not caused by Operation Windigo, so it has a different payload. The malware didn't do anything when I infected the VM earlier in the day. 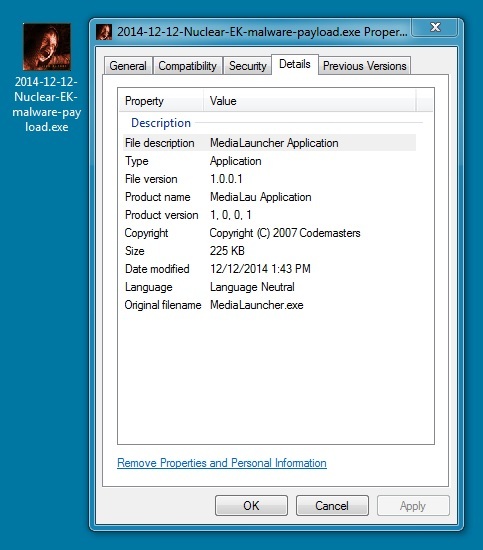 I ran the malware on another VM later that evening and got ransomware (see the image below).